Abell 262, Abell 383, Abell 1413, and Abell 2390: Is Dark Matter "Fuzzy"? A new study of Chandra observations of 13 galaxy clusters tested the properties of dark matter. Dark matter is a mysterious and invisible substance that constitutes the majority of matter in the Universe. The latest results suggest dark matter could have wave-like properties due to quantum mechanics. The model that was tested with Chandra data is known as "fuzzy" dark matter. Coordinates (J2000) RA 01h 52m 46.8s | Dec +36° 09' 05"
Coordinates (J2000) RA 11h 55m 18.0s | Dec 23° 24' 19"
Coordinates (J2000) RA 21h 53m 34.6s | Dec +17° 40' 10"
I'm a college school student in Alaska. I've always loved particle physics and quantum physics. But as the idea of dark matter is fascinating I also find it to be upsetting. Because everywhere I search for answers there is little detail. Then I am left to wonder if the reason nothing effects this mystery mass, is because what ever it is made up of, just isn't moving at all. And just by the vibrational frequency of normal mass it causes quantum tunneling to come into effect. Then essentially forcing it out of existence. I think the whole universe is like a pendulum. May be everything will return to its original place one day. This is an appreciable work. Amazing. Hubble is worth every penny spent. 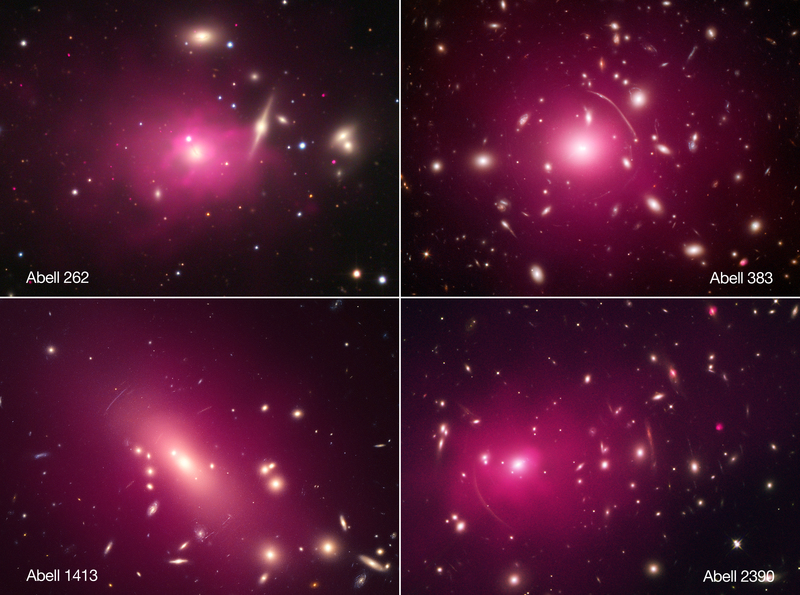 Galaxy clusters used to study dark matter. Different distances from millions to billions of light years away. 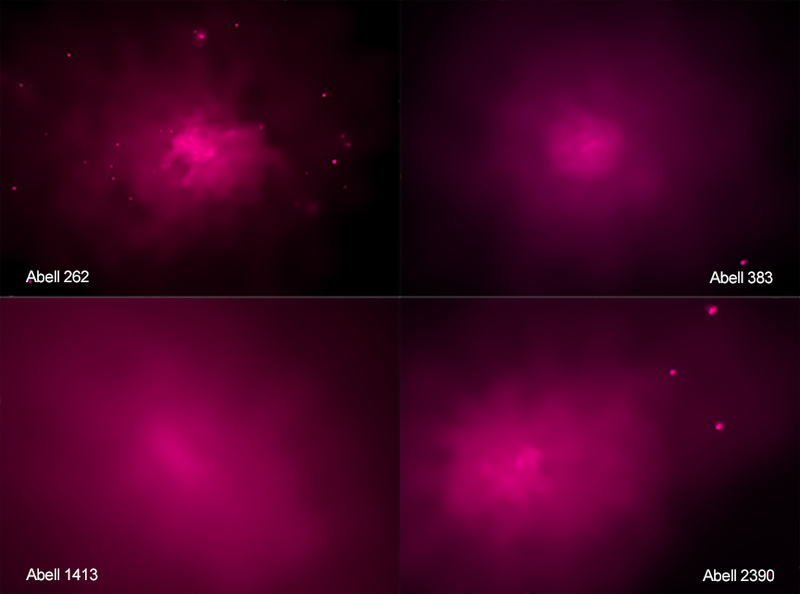 Combines X-rays from Chandra X-ray Observatory and optical data from other telescopes. Each is different, from 400 million to 3 billion light years across. X-rays are pink. Optical is red, green, and blue. In the constellations Andromeda, Eridanus, Leo, and Pegasus. Blog: Is Dark Matter "Fuzzy"?